Surviving ebullism is the biggest engineering challenge in the development of high altitude crew escape systems for next-generation spacecraft. In the early 1800s, laboratory experiments on normal healthy animals exposed to near vacuum environments revealed catastrophic consequences. A vacuum is characterized by the absence of life-sustaining characteristics present on Earth’s surface like oxygen, warmth, and pressure. Those experiments established that an altitude at and above roughly 19.2 km, having a barometric pressure about one sixteenth of that at sea level, gas bubbles begin to form in the body’s fluids. This phenomenon is known as ebullism and can result in unconsciousness or even death. The most life-threatening effects of ebullism occur in the lungs, heart, and brain. At near vacuum conditions, tremendous pressure differential between the lung and ambient environment results in rapid decompression that can cause severe damage to those systems – rupturing the lungs, tearing the cardiovascular myocardium, and damaging the central nervous system. This, then, is the life threatening condition that crews in air or space including pilots, skydivers, space tourists, and astronauts can expect to face. In order to circumvent the functional limit of altitude on human physiology, human beings must carry their Earth-like environment with them during flight, work, or exploration in space. Inside a spacecraft, atmosphere can be controlled by cabin pressurization so that no special clothing is needed. But outside the spacecraft like in parachute jumps, humans must wear partial or full pressure suits. For as long as the problem of ebullism has been known, experiments on the consequences of altitude have attempted to improve survival. The Red Bull Stratos project aimed to contribute to the research in this area by collecting data on the human body performance during a descent from high altitude and advancing the design of such life-saving space suits. 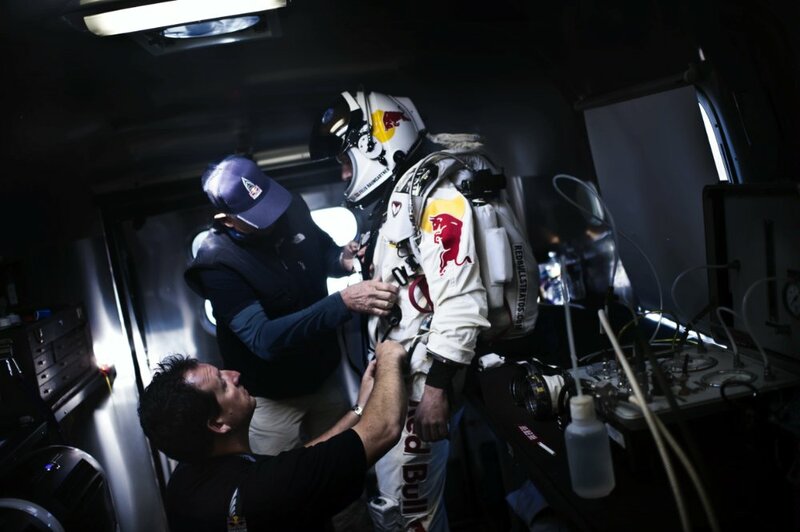 Austrian skydiver Felix Baumgartner survived his plunge, thanks in part to his specialized, pressurized protection. On October 14, 2012, Austrian daredevil Felix Baumgartner stepped out of his fiberglass Red Bull Stratos capsule, 39,045 m above sea level, jumped, and survived the hostile near-space environment. At sea level, average barometric pressure is 760 mmHg and temperature is 20 °C, conditions that humans have been adapted to for thousands of years. But at 39 km, pressure and temperature are extremely low, 3.26 mmHg and -57°C tem­perature respectively, conditions fatal to exposed humans. What protected Baumgartner from these conditions? A portable Earth-like environment called a pressure suit, which is a specially designed piece of technology that kept the pressure around his body something like what a normal human would experience at 11 km. At that altitude, atmosphere is about one percent of the ground-level air pressure that the human physiology is specifically adapted to for the normal functioning of the brain, heart, and lungs. Protected only by his special suit ensemble – 45 kg pressurized suit and 3.6 kg helmet – Baumgartner’s successful stratospheric jump demonstrates humans can survive lethally thin atmosphere and intense cold of near-space at an altitude of 39 km. Baumgartner became the skydiver to achieve the highest parachute jump and the first human to break the sound barrier outside a plane. Baumgartner wears his specially designed spacesuit to be protected from the hazardous conditions of stratosphere. (Credits: Red Bull Stratos). Baumgartner’s full-pressure suit is a custom-tailored state-of-the art technology, which was designed by space-suit specialists at the David Clark Company. The suit has four layers: an innermost comfort liner; a bladder, or gas container, fitted to his body; netting to keep the bladder in place; and an insulating exterior. The suit is designed to maintain Baumgartner’s internal pressure equivalent to that found at 11 km. Baumgartner’s new suit is built on historical knowledge from the full-pressure suits that space shuttle astronauts wore. Innovative features include critical and potentially lifesaving features: maneuverability and vision. Unlike an astronaut who is tethered to the outside of the International Space Station during an Extravehicular Activity (EVA), a skydiver needs the ability to move more quickly. NASA’s 12-standard sized space suits were designed for sitting and intended to keep astronauts alive if the shuttle cabin lost pressure while entering or exiting orbit. When fully pressurized, they severely limit mobility and hinder maneuvering efforts through a bail out hatch. This is an area where the successful demonstration of Baumgartner’s suit is a significant achievement that could take the space travel industry to a new level. In his Earth-like environment suit, he managed to maneuver carefully through the capsule and survived the parachute jump. He first hopped off the capsule’s platform, achieved a pencil dive, and formed a crouched “delta” position with his arms at the side to maximize his speed. If he flubbed that quick initial jump – if he missed a step or if he pushed off with excessive force, say – he could have suddenly gone into an unstoppable spin with a force that could kill him. As it was, Baumgartner was able to achieve sufficient maneuverability to bring himself out of a dangerous spin. Baumgartner’s record-breaking solo feat, backed up by expert teams, may have raised the bar for humans looking to the skies. The next logical evolutionary step might be on two fronts – development of space travel and exploration suits and development of individual atmospheric re-entry suits. Specialists may be closer to developing a suit that could be used to push an astronaut through the atmosphere from space without the help of a pressurized spaceship. 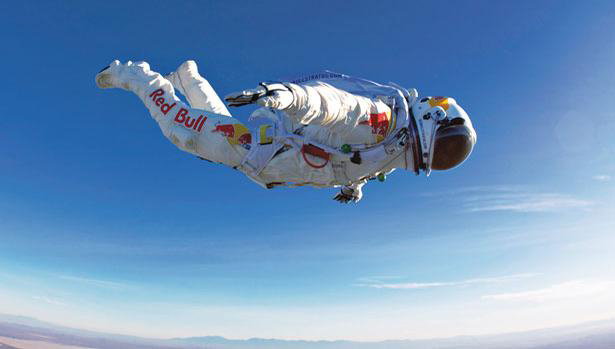 Baumgartner’s free fall could be a leap in the right direction. One day, suits could be survival clothes if astronauts have to bail out of a malfunctioning rocket on its way to space or Earth.